At the end of January 2014 it was announced that at the CERN in Geneva an international collaboration, which includes Italian researchers of the Istituto Nazionale di Fisica Nucleare (INFN), had been able to produce and trap a beam of antihydrogen atoms for the first time. This is the extraordinary result of the Asacusa experiment that will allow an accurate testing of the predictions of the Standard Model and might even help to solve the cosmological mystery of why matter prevails over antimatter in the Universe. The experimental apparatus consists of a three and a half-metre long tube in which beams of antimatter are produced and then trapped. 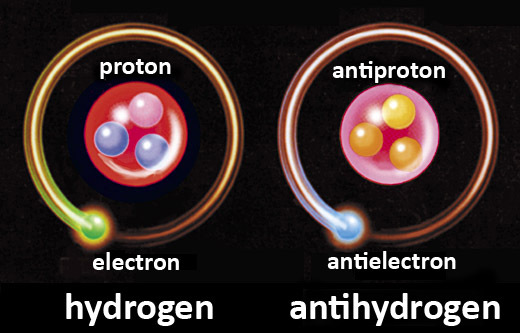 Antimatter is represented by antihydrogen. 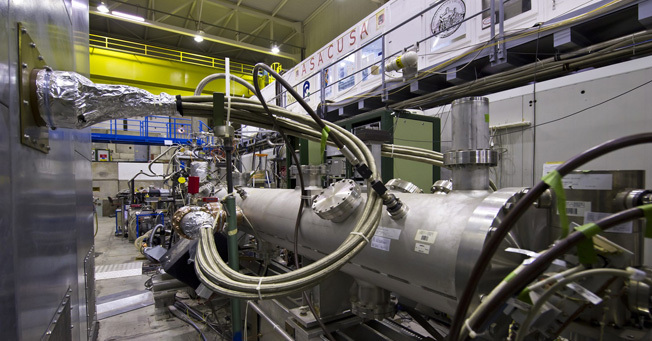 In fact, in the experiment 80 antihydrogen atoms were generated and for the first time ever this antimatter beam was analysed by a detector placed 2.7 metres downstream. The objective for the future is to produce antimatter beams that are more abundant and stable. But let us proceed step by step and try to understand what antimatter is. The matter that surrounds us, of which humans and every other animate or inanimate creature of the Earth is composed, including even the remotest bodies of the Universe, is made up of atoms: systems made up of electrons, negatively charged particles, that orbit around a positively charged nucleus. Besides ordinary matter, particle physics envisages even the existence of particles that are identical to those that make up atoms but have opposite charge, in other words, antimatter. Hence we hear about positrons, identical to electrons but with a positive charge, or of negatively charged anti-nuclei. A particles and its antiparticle have identical mass and hence gravity affects them in the same way. However, their behaviour is different when they are subjected to a strong electromagnetic and nuclear force. Another important characteristic: when a particle and its antiparticle meet they annihilate each other, in other words, they destroy each other converting their energy into radiation. The first studies on antimatter date back to the 1930s, a fundamental period for physics because in less than thirty years the foundations of modern physics were laid. In those years, the 26 year-old British physicist and mathematician Paul Dirac formulated a theory (relativistic quantum mechanics) that was able to explain the behaviour of high energy subatomic particles and that took into consideration both Einstein’s special theory of relativity and quantum mechanics. This theory states that, for every charged particle, there exists another particle with identical mass but opposite electric charge. Antimatter had arrived on the scene! The scientific community received the news with great scepticism. It certainly was a rather futuristic concept. The fundamental problem was that the particle had been theorised but not observed by Dirac and this left the researchers doubtful. 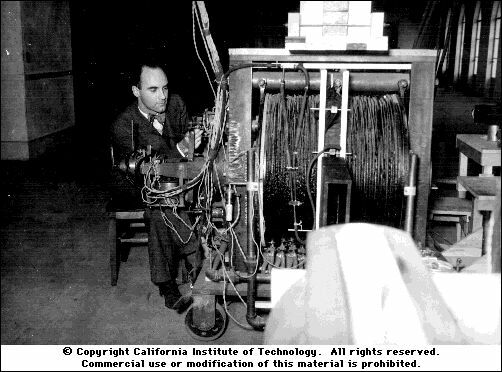 It was not long before an American physicist, Carl Anderson, during an experiment on cosmic rays in 1932, was able to find proof for the existence of antimatter. 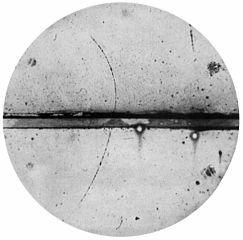 The experiment studied the tracks left by cosmic rays when they cross a cloud chamber [see image]. Among the many cosmic tracks, Anderson pinpointed an “anomalous” one, which corresponded to the passage of a particle with the same mass as an electron but with opposite electric charge. He had discovered the antielectron, later called positron. Since then antimatter has been generated almost daily in high-energy laboratories. However, antimatter cannot be observed in a stable form in the Universe. In some nuclear processes, particles of antimatter can be created but they are short-lived because when they encounter other particles both will be annihilated. A piece of advice for the most resourceful of you: do not hunt for antiplanets, antigalaxies or more, you would not find anything. How can antimatter be studied? In order to study antimatter it has to be produced artificially in specific equipment and then kept isolated for a rather long period of time. It goes without saying that once antimatter has been generated it must be kept at an appropriate distance from matter to prevent annihilation. How is antimatter generated? When matter and antimatter meet, they annihilate each other releasing electromagnetic radiation. Hence, it follows that, in theory, inverting the process it should be possible to create pairs of particles and antiparticles from energy in the form of electromagnetic radiation. In other words, when high-energy radiation crosses matter, particle-antiparticle pairs are generated spontaneously (essentially positrons). This mechanism is used in research laboratories around the world. In order to obtain heavier antiparticles, positrons are used. In fact, once produced, positrons are accelerated in accelerators (ringed structures) and made to collide with electrons travelling with velocity of equal magnitude but in the opposite direction. The energy released is utilised to create pairs of antiparticles of much greater mass than the positron. How can antimatter be “trapped”? Until now we have used the term “trapping” antimatter: someone might have asked himself how it is done, since it has been made clear that antimatter cannot just be put into a big or small box, because the latter is made of matter and it would lead to the annihilation of both. Antimatter is confined using an intense magnetic field that forces the antiparticles to remain trapped in a magnetic net, from which they are unable to escape. This technique of confinement is called magnetic trap, a term which is self-explanatory. Why are we made of matter? This question does not have a commonly accepted answer yet. To answer this question one must go back in time to when the Universe was formed, to the Big Bang. A few moments after the Big Bang, around 14 billion years ago, the Universe was in a phase of extremely rapid expansion. The Universe was very dense and hot. In these conditions particles and antiparticles were constantly being created from electromagnetic radiation. At the same time, however, the particle-antiparticle pairs annihilated each other back into electromagnetic energy. We now know about the cosmic microwave background (CMB), a radiation that permeates the entire Universe. According to the Big Bang Theory, it represents the radiation produced by the annihilation of matter and antimatter that took place a few instants after the Big Bang. CMB radiation is an extremely low frequency and hence low-energy radiation, because the Universe has expanded and consequently the radiation energy has decreased, getting lower in an increasing volume of space. The consequence of this annihilation was the total disappearance of antimatter, while a small proportion of matter (one in a billion) was saved. Why did matter prevail over antimatter? According to the Big Bang Theory there is no reason to believe that matter was already present in greater amounts; on the contrary, matter and antimatter were created in equal amounts. So what brought about this result? An explanation could be that matter and antimatter do not behave in the same way in particular circumstances. The aim of the Asacusa experiment is to highlight and study this asymmetrical behaviour.